Social Media tutorials , infographics and blog from Andrew Macarthy, author of Amazon Bestseller, 500 Social Media Marketing Tips. How to Make a DIY iPhone (Mobile Phone) Tripod Stand - in 30 Seconds! These lids tend to be pretty sturdy, which you'll need to hold the weight of your phone. Cut the lines as straight as you can, all the way down or just a little bit short. 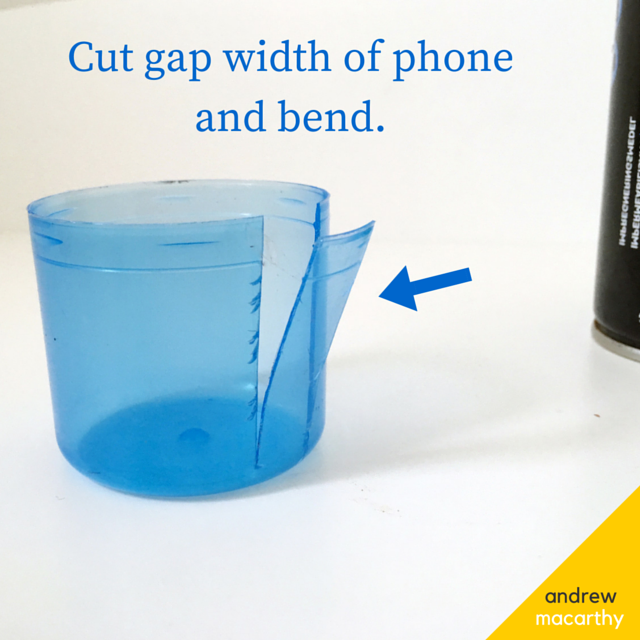 The edges of the cut lid can be a bit sharp, so if you're even the littlest bit worried about scratching your phone, make sure it's protected! That's all there is to it! I tried this method on a windswept seafront the other night (new iPhone 6 perched somewhat perilously on a ledge over a 10ft drop!) and it held up pretty well. Let me know if you're going to give this a go, and tweet me @andrewmacarthy to show me your efforts! Want to pin the tutorial as an infographic? Here you go!